A neat little trick to make a kitchen appear larger is to opt for open storage. This can be as simple as unscrewing your cabinet doors! This draws focus upwards to your lovely dishware, making the room appear larger. Also, if your dishware brings some pops of color, that livens up and widens the room, too. This tub may be tiny, but it’s a little piece of luxury in a tiny bathroom! Great for bathing kids or even taking a bath for one if you’re on the shorter side, this shrunken down tub brings a little luxe that your tiny space may be lacking. Instead of walls, which break up an already small space, try dividers. This gives the feeling of a traditional house set up (a.k.a. rooms) without cutting off the space. Curtains or glass panes would also serve this purpose well! Nowhere to put your microwave? Don’t fret about lack of counter space! Try these retractable drawers, instead. Perfect for cutlery or small appliances, these drawers are crafty, hidden storage that keeps things out of your space until you need them. White decor and walls makes a room look immediately bigger and brighter. Go for all white to really trick the eye and for a fresh, trendy look. In a tiny space, you need to use all the space you have! Don’t forget about under your stairs. Whether this is a roll-out cart or drawers, under-stair space is deep and tall, the perfect place for hidden storage. Don’t let clutter build! If you don’t have a place for mail or are lacking wall space for pictures, try a DIY organizational board. You can make this in whatever pattern you like and use it to keep mail organized, hang daily reminders, or display pictures of loved ones. No overhead lighting to speak of? I. Feel. You. Without built-in lights, your space can feel smaller and, well, darker. Add some overhead light on prime spots like under shelves and under kitchen cabinets. You can get LED light kits at most major retailers. If you have no space for your jewels, turn to a tension rod. 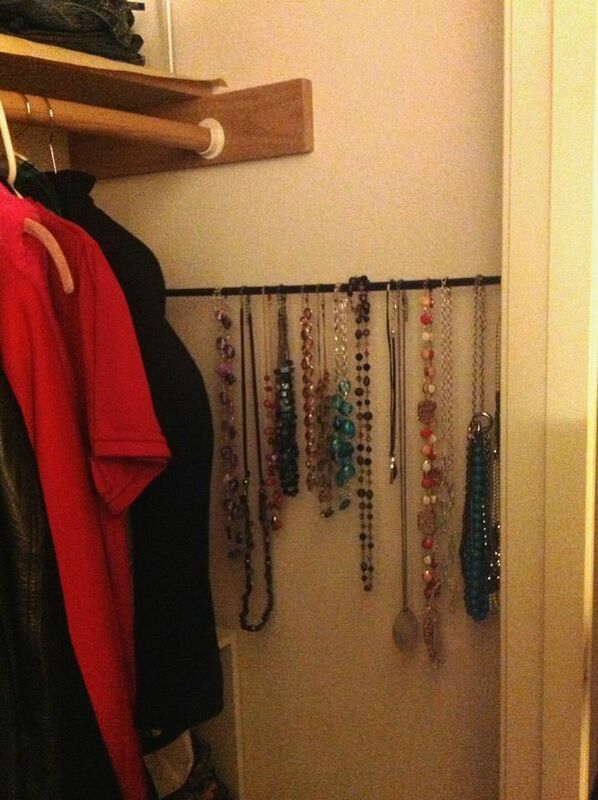 You can easily install a tension rod anywhere in your home (this organizer chose their closet for more private storage) and hang your jewels off it, so as to not take up storage needed for other things. I have lived in more than one apartment where there is no room for a bedside table. You just have to get creative. For instance, try this bedside ledge instead! It may be smaller than a full table, but it’s enough for your phone and a mug of tea…and that sounds like all you need to me. Small drawers? No problem! Use a clothing separator to keep your clothes organized and compact in your small drawer space. This works best with undergarments, but t-shirts and shorts can easily be rolled and stored this way as well. Yours are under utilized. They have so much open space most people wouldn’t think about using…until now. Use the back of doors to create an organizational space for clothes, scarves, jewelry – you name it. Whether you have a big space or small, no one wants wires hanging around their home. They don’t look so pretty. Instead, consolidate your electronics and wires to a bed side drawer, in which you have a hidden power strip. Very sneaky. Like your doors, underneath your bed you have cavernous space that is most likely not being used. Even if it is, it’s probably a mess. Buy some cheap Ikea bookshelves to proficiently organize all your odds and ends. If you have no shelf space to speak of, make your own! And it doesn’t have to cost you an arm and a leg. Add a little extra storage by turning this folder organizer into a DIY corner shelf, perfect for an office or bedroom. The space under your sink is a dreaded one – but it’s also extra space! And there is no space to waste. Add tension rods below to hang garbage bags or cleaning products from, so you can use your shelf space for other things. To make the most of your pantry, you should use up every ounce of wall space that you can. For narrow spaces, try using little wire pencil baskets. They make a great DIY spice rack and save your cabinet space big time. It might look a little silly…but when you’ve got no room to spare, you don’t care. Install some wire racks under pantry shelves to hold as much as possible. Save counter space and drawer space in your bathroom by magnetizing your beauty supplies. With small strips of magnet, you can hang everything from make up to brushes to cups for jewelry off any magnetic surface in your bathroom. Talk about using vertical space. No dining room table? If you’ve got a window with a view, you don’t need one! Build yourself your own little breakfast bar and enjoy your meal while taking in the day. Do you have any tricks for keeping your tiny space organized? Share them in the comments section below.